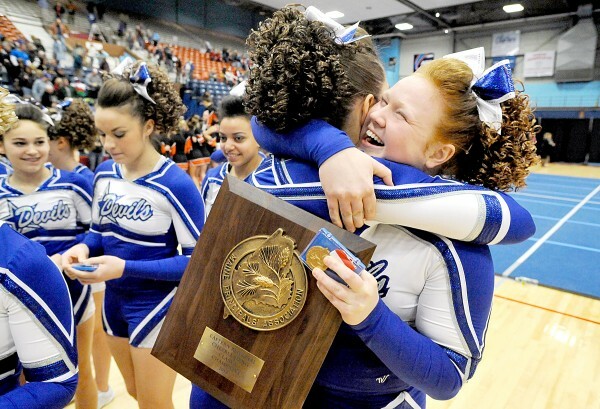 Taylor Pratt, right, celebrates with Erika Thibault after Lewiston High School won the Class A East Regional Cheering Competition at the Augusta Civic Center on Saturday. 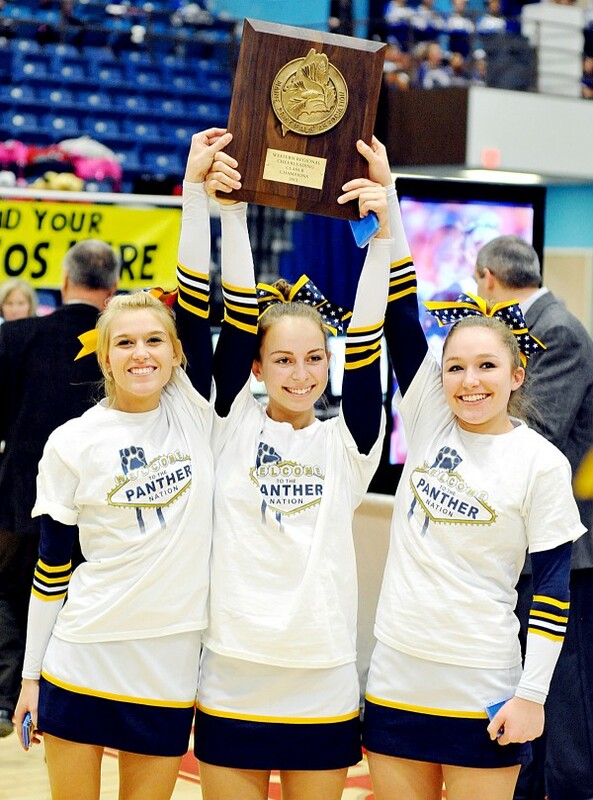 Charlene Wilbur, left, Kelsie Grady, middle, and Jessica Prescott hold of the Maine Principals' Association plaque after Medomak Valley High School won the Class B West Regional Cheering Competition at the Augusta Civic Center on Saturday. Bangor High School competes during the Class A East Regional Cheering Competition at the Augusta Civic Center on Saturday. 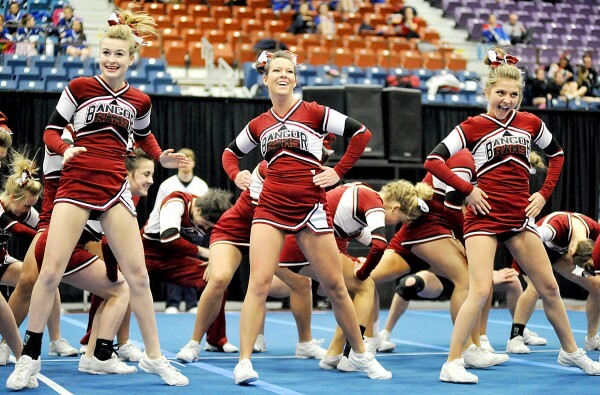 AUGUSTA — Saturday was just another building block in the championship pyramid for Lewiston cheerleading. Five days after pocketing their fifth straight KVAC title, the Blue Devils bagged a fourth consecutive Eastern Class A crown on the same Augusta Civic Center floor. Lewiston now chases its third state championship in succession Feb. 9 at Bangor Auditorium. Then, in March, comes a shot at a second New England title in Lawrence, Mass. And if you need a number to complete the arithmetic progression, well, there’s no question about who’s No. 1 in the sport around here. The Devils’ score of 161.4 points on a scale of 175 was six better than its KVAC prelude and only two beneath the team’s 2012 state championship threshold. Runner-up Bangor finished seven points back. Edward Little (fourth) and Oxford Hills (fifth) joined Brewer (third) and Hampden (sixth) in qualifying for the state meet. The top six teams from each region earned that distinction. Title defenses were the rule. In addition to the career grand slam for Lewiston’s seniors, Lisbon made it back-to-back championships in Western Class C. Medomak Valley ruled Western Class B for the third year in a row. Despite all the decor in its trophy case, Lewiston wasn’t afraid to make a dramatic change and separate itself from that recent tradition. The Devils decided to change choreographers this year, turning over the music and dance portion of its program to a duo from California. Five seniors and five juniors give Lewiston ample ties to last winter’s dream team. Winning never loses its appeal or its excitement, though. After the initial collective shout when the public address announcer declared the Devils champions once again, there was a second shriek when Morency leaned in and told the team its score. Lewiston was accompanied to the capital city by its rabid fans, more than 40 of whom were lined up outside the locked doors of the civic center at 5 a.m. — eight hours before the team was scheduled to perform. Lisbon rewarded its loyal spectators with a one-sided victory in Class C.
The MVC champions backed up those credentials with a score of 128.3. Monmouth was second with 110.4. It was a jump of more than 15 points from the conference to the regional meet for the Greyhounds. Lisbon achieved its encore with a younger team this season. Six seniors led the way. In addition to perennial state qualifier Monmouth, fellow MVC schools Madison, St. Dom’s and Dirigo also advanced to the next level along with Traip. Medomak outlasted the competition in a Class B meet that saw all the top contenders have at least one bobbled stunt. The Panthers appeared to have two major miscues midway through the program, but persistence and the intricacy of their routine paid dividends. Of the 15 cheerleaders on the floor for the Panthers, all but three were freshmen or sophomores. Jessie Prescott and Kelsie Grady are the lone seniors. A third, Charlene Wilbur, is injured. Medomak (131.4) edged Wells (129.9) in the closest battle of the day. Gardiner was third. Leavitt, Poland and Morse also punched their tickets to the state showcase.